Cranford remains one of the most sought after towns in Union County. Here’s what’s been happening in the Cranford real estate market this winter. There were 86 homes offered for sale in Cranford in December compared to the 12 month average of 78. There were 17 single family homes sold in Cranford in July, significantly less than the 33 that were sold in June but only slightly less than the 12 month average of 18. Decreasing inventory drive prices up and/or decrease the length of time it takes to sell a home. 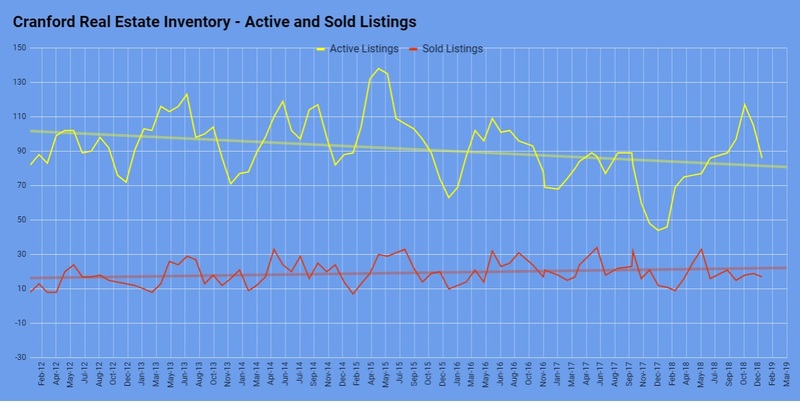 Inventory and sales are variable monthly as shown by the peaks and valleys in the graph above. Some variability can also be attributed to homes that are more desirable or less desirable than the average Cranford home. Homes that are in exceptional condition or well priced won’t stay on the market long, whereas distressed properties or homes in disrepair stay around longer and cause data variations. Even conditions such as weather affect home sales – fewer buyers are out looking on days that are oppressively hot or rainy. The average sale price of a home sold in Cranford in December was $510,124, about 2% higher than the 12 month average of $501,062. This could be a reflection of many factors. The sale of a few exceptional homes may skew sales prices higher, and the decreased inventory this winter may be causing bidding wars on listed properties. The important thing to note about the graph is not the variability but rather the overall long term trend which is represented by the straight black line which shows a healthy increase in home prices in Cranford over the past six years. The homes that were sold in December in Cranford had been on the market for an average of 41 days – slightly slower than the 12 month average in Cranford of 39.6 days. Summer sales are usually brisk whereas winter sales tend to slow down. Homes that are in better condition, are priced better, or are marketed more strongly tend to sell faster. 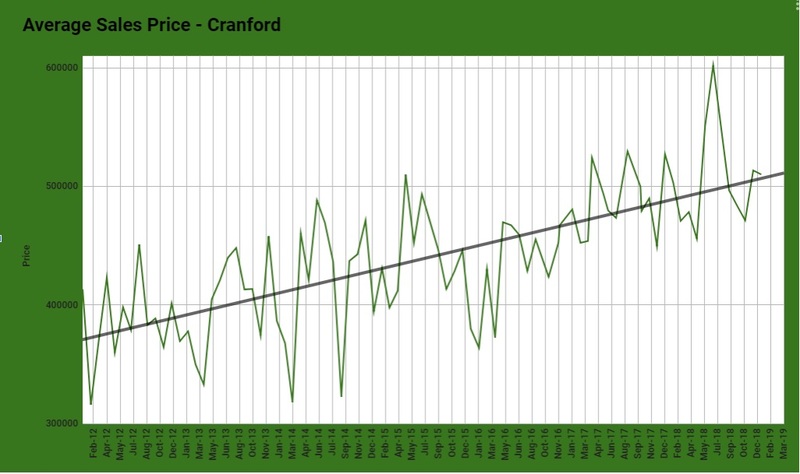 The overall trend line in this graph shows a strong decrease in days on market in Cranford going back six years. If you’re on the fence about selling your home, this may be the perfect opportunity to get the most money in the shortest amount of time. Even in a shrinking inventory situation, you’re still competing with other homes on the market. View the other homes that are offered for sale and make sure your home is the best one in its price range. To read more about the real estate market in Cranford, please read our earlier market reports here. For more information on how Team Zuhl can help you, please click here or call us at 908-917-4189. Next 19 Million Millennials are "Mortgage Ready"